In the pursuit of global poverty reduction, a minority of countries risks being left behind, both in terms of their levels of deprivation and in the way global progress is accounted for. This suggests that the “leave no-one behind” principle, originally intended to draw attention to marginalized groups such as lower castes or the disabled, might equally be applied to countries. This note undertakes some preliminary analysis to identify which countries are at greatest risk of being left behind, and their common characteristics. It calls for new efforts to ensure these countries are not ignored and calls for further policy research that might ultimately help raise their performance. The start of the 21st century has been characterized by both economic convergence and divergence. Convergence occurs when poorer countries record faster growth in incomes than richer economies, thereby narrowing the gap in living standards between nations. This implies that a country’s rate of economic growth per capita is inversely correlated to its initial level of income. The blue line in Figure 1 shows evidence of this relationship across the world’s economies for the period 2000-2015. This represents a striking reversal of the pattern of the previous 200 years. While evidence of convergence across the world’s economies on average is robust, some countries continue to be left behind, including many of the world’s poorest countries. 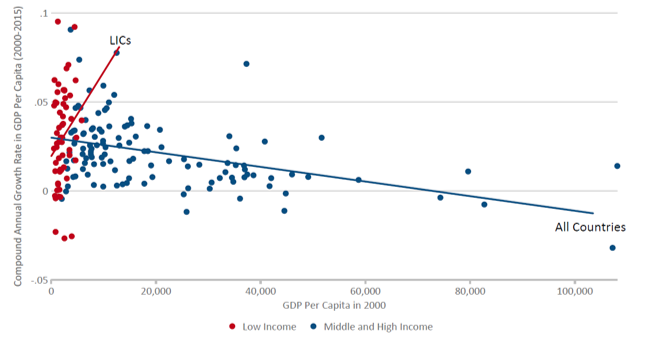 The result is that, among the world’s low-income countries, living standards have diverged over the same period, with the poorest among them recording the most meager income growth on average. This is illustrated by the red line in Figure 1. Note: Author’s calculations based on World Bank 2016. Country income groups refer to the World Bank classification in the year 2000. The negative correlation found among all economies is significant at the 1 percent level. The positive correlation found among all low-income countries is significant at the 5 percent level. These two contrasting trends—convergence among the world’s economies, but divergence among its poorest—underpin some of the leading narratives in geopolitics and global development. The rapid rise of emerging economies has shaken up the world economic order; it has also spurred dramatic improvements in health, education, employment and access to energy, benefiting hundreds of millions of people. It has led to the emergence of a truly global middle class, representing nearly half of humanity. Meanwhile, some countries remain on the bottom rung of the development ladder, hardly budging from the levels of deprivation that prevailed in the poorest economies a generation ago. Included in this group are several fragile and conflict-affected states, whose spillover effects on others via an open and integrated global economy is seen as one of the world’s leading global risks. The two trends are especially relevant to understanding global goals focused on the reduction of extreme poverty. The first Millennium Development Goal sought to halve the rate of extreme poverty in the developing world between 1990 and 2015. That goal was achieved 7 years ahead of schedule—a result that is attributable to the improved growth performance of developing economies, led by China and India. On the latest count, the share of people living under $1.90 a day is down 74 percent since 1990, and the number of people below this threshold is down 1.2 billion, or 65 percent. The celebration of that goal serves as a tribute to the impact of convergence. Despite that success, the record on global poverty reduction over the past quarter-century has not been unblemished. The number of people living in extreme poverty in fragile states has risen. The living standards of the very poorest people in the world—the “consumption floor”—has risen only meagerly. The first Sustainable Development Goal (SDG)—to end poverty in all its forms everywhere— attempts to shift the focus to those who were left behind during the past 25 years by eradicating extreme poverty by 2030. Ending extreme poverty places demands on all countries where poverty exists today. (There are even some demands on countries that have already eliminated extreme poverty to stop poverty reemerging.) But the biggest challenge clearly rests with the world’s poorest countries that currently stand furthest from zero. In other words, to achieve the new goal, the pattern of divergence among the world’s poorest countries will almost certainly have to stop. The World Bank is the organization responsible for monitoring global progress on poverty reduction. It has embraced the goal to end extreme poverty by enshrining it as one of two institutional goals. However, rather than adopting SDG 1 in a literal sense, it has instead set a target to lower the global poverty rate to 3 percent by 2030. This explanation is disingenuous on two levels. First, whereas frictional unemployment is a necessary characteristic of functioning labor markets, there is nothing inevitable about people temporarily falling into poverty. Indeed, the Bank commits billions of dollars each year to support social protection programs in developing economies precisely so that households and communities that are vulnerable to shocks are able to withstand setbacks without falling into poverty. Second, the attainment of a global poverty rate of three percent would almost certainly entail a much higher poverty rate in a minority of countries—counterbalanced by zero poverty in the majority of countries—where poverty could not reasonably be characterized as frictional or temporary. This means that the target could be met through ongoing convergence among the world’s economies while the very poorest countries continue to diverge and be left behind. This is not to imply that the Bank’s 3 percent target lacks ambition. On the contrary, projections based on an extrapolation of recent country-level growth trajectories indicates a global poverty rate of around 5 percent in 2030. Meeting the Bank’s target would therefore require an improvement, on average, in the performance of developing economies—whether in terms of growth, its inclusivity, or both—relative to the already improved performance of developing economies since the start of the century. However, that would not preclude a minority of poor countries being excluded from these gains. Thus, in the pursuit of global poverty reduction, a minority of countries risks being left behind both in terms of their levels of deprivation and in the way global progress is accounted for. This suggests that the “leave no-one behind” principle, originally intended to draw attention to marginalized groups such as lower castes or the disabled, might equally be applied to countries. Which countries are most at risk of being left behind in the fight against extreme poverty? In an earlier publication we classified countries according to their poverty rate and their track record in poverty reduction over the preceding decade. Twenty-four countries combining high poverty rates and poor track records were identified as facing the greatest risk of failing to eliminate extreme poverty by 2030. We adapt that approach here and make use of more recent data—several new household surveys and the latest International Comparison Program (ICP) round of international prices—to identify an up-to-date group of countries most at risk of being left behind. We begin by taking the World Bank estimates of extreme poverty in each country in 2013—the most recent year for which a global poverty estimate is available—see Figure 2. We classify all countries with a poverty rate above 45 percent as being at risk. These countries would fail to reach a 3 percent rate of extreme poverty by 2030 even if they matched the speed of sustained poverty reduction achieved by the fastest performers on record: a reduction of 2.5 percentage points a year achieved by China and Vietnam in the 1990s and 2000s. 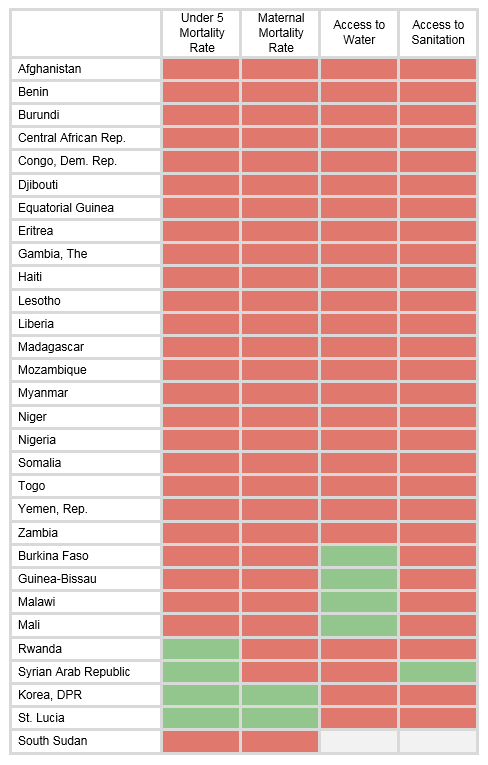 It is striking that all these countries, other than Haiti, are located in sub-Saharan Africa. 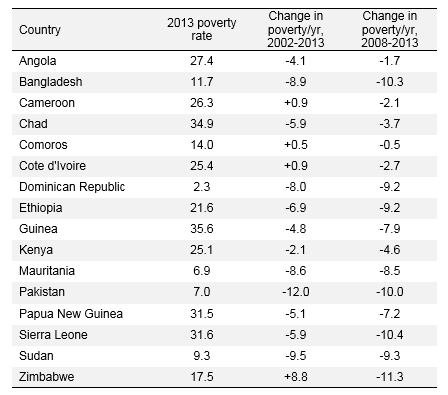 We add to this list those countries with a poverty rate above 20 percent that have recorded zero or meager progress in reducing poverty between 2002 and 2013, and between 2008 and 2013. We use both a shorter and longer timeframe to exclude countries that have achieved a recent turnaround in performance, such as Cote d’Ivoire. Finally, we include countries that lack any household survey or valid international price data that we suspect would otherwise make the list. 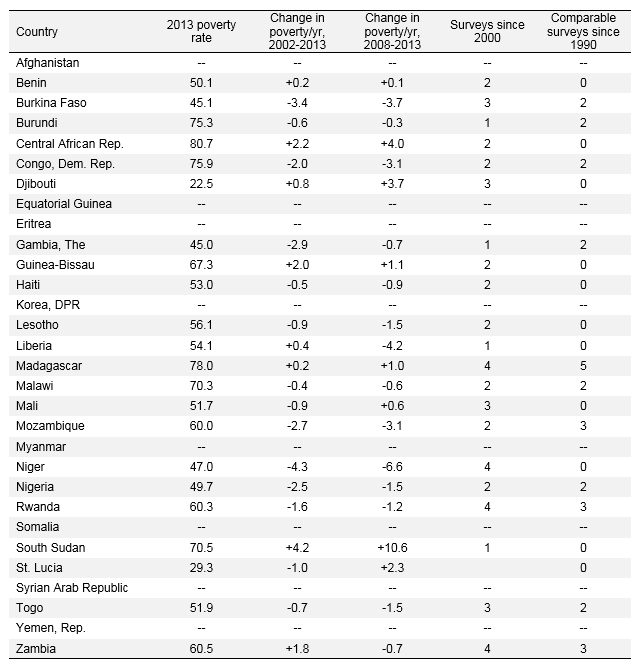 This generates a combined group of 30 countries that we judge as being most at risk of being left behind—see Table 1. This approach is not beyond scrutiny. It relies on subjective judgment, artificial cut-offs and the continuation of past trends. Arguably its biggest weakness, however, is the weight it places on the reliability of poverty estimates. This could lead to errors of omission and commission. First, the poverty estimates of countries that are included in our analysis in many cases rely excessively on extrapolation given the limited frequency of household surveys. This affects the accuracy both of countries’ poverty rates and their poverty reduction. Of the 22 countries we categorize as being most at risk of being left behind that have available poverty estimates, four have undertaken only one household survey in the 2000s. St. Lucia’s poverty estimates rely entirely on extrapolation from a survey in the 1990s. 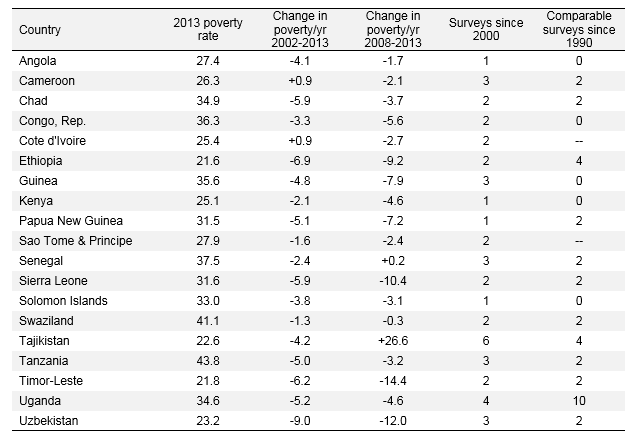 Of the 19 countries with poverty rates above 20 percent in 2013 that are not included in our group only on the basis of their satisfactory recent performance in poverty reduction, four countries have only a single household survey in the 2000s—see Table 2. Second, even where countries have what appear to be a sufficient number of surveys, differences in survey design or implementation across surveys within the same country mean their results may not be strictly comparable. This is a particular problem for our assessment of each country’s track record in poverty reduction. A recent study by the World Bank assessed the comparability of household surveys according to their regional coverage, seasonality, reporting instruments, and recall period. Eleven of the 22 countries we categorize as most at risk of being left behind based on their poverty estimates do not have two comparable surveys since 1990. Of the 19 countries with poverty rates above 20 percent in 2013 that are not included in our group, a further seven lack two comparable surveys since 1990. There are several other problems with the reliability of poverty estimates that we do not elaborate on here, including differences in survey design and implementation between countries; the accuracy of domestic price data; and the accuracy of international price data. Given our concerns with the reliability of poverty estimates, we also consider the performance of countries on non-monetary poverty measures. These measures can serve as a rough proxy for traditional poverty estimates and thus help in assessing their validity. They are also of intrinsic value given the multi-dimensional nature of poverty, which traditional monetary poverty measures don not capture. A recent Brookings study assesses which countries are on or off track to meet some of the foremost Sustainable Development Goals for non-monetary aspects of poverty. As with our assessment of monetary poverty, the authors’ analysis for each goal is based on each country’s current distance from the target and their recent record of performance. They identify 37 countries that are off-track on each of four headline goals: child mortality (under-5 and neonatal), maternal mortality, access to drinking water, and access to sanitation. Table 3 shows the status of the 30 countries we categorize as most at risk of being left behind on extreme poverty, on each of the four multi-dimensional goals. Twenty-one of the countries are off-track on all four goals. That lends some confidence to their inclusion in our group of at-risk countries. Five countries others are on-track on one goal. Another three countries, all of which have inadequate data for reliable poverty measurement, are on track on two goals. Table 4 identifies the remaining 16 countries that are off-track on all four multi-dimensional goals but not included in our group of countries at risk of being left behind. Nine of these have reported monetary poverty rates above 20 percent and might reasonably be misclassified by our classification. The preceding analysis highlights the difficulty of accurately identifying which countries are most of risk of being left behind on extreme poverty. Further analysis could be valuable in classifying countries with greater confidence. What are the common characteristics of countries at risk of being left behind? Identifying countries at risk of being left behind can serve a valuable purpose by drawing attention to them within the development community. A more ambitious objective is to understand what holds back the development of these countries, and to generate policy ideas that might raise their performance. We begin here by simply identifying some common characteristics among the 30 countries we classify as being most at risk of being left behind—see Table 5. Twenty-three of the 30 countries are in sub-Saharan Africa. The remaining seven are in the Caribbean (Haiti and St Lucia), the Middle East (Syria, Yemen), and South and East Asia (Afghanistan, North Korea, Myanmar). Twenty-five of the 30 countries are relatively small, with populations below 30 million people. Each of these countries on its own is vulnerable to being overlooked by the World Bank in global poverty monitoring, given that the attainment of a 3 percent global poverty target is compatible with several small countries failing to make progress. (By contrast, a zero target would force attention on each and every country.) The Bank deserves credit for acknowledging this and stressing the moral imperative of reducing poverty in all countries. Collectively, however, the 30 countries can account for more than a third of people living under $1.90 a day in 2013, or 280 million people. Eighteen of the 30 countries are considered fragile by the World Bank based on its more recent classification. This high share is consistent with prior analysis that has drawn attention to the rising share of global poverty that is located in fragile states. Nine countries are classified as resource rich by the IMF on the basis that more than 20 percent of their exports are nonrenewable commodities. Four of the 30 countries are both fragile and resource-rich. This note makes the case that, in the pursuit of global poverty reduction, a minority of countries risks being left behind both in terms of their levels of deprivation and in the way global progress is accounted for. Further research is needed to identify with greater confidence those countries at risk of being left behind, to understand the factors holding back their development, and to generate policy ideas that might ultimately help raise their performance. This replicates the finding by Roy et al. 2016. World Bank 2015. Similar explanations by the Bank can be found elsewhere, for instance, World Bank 2014. Chandy et al. 2015. Countries with no available data were classified based on a combination of other relevant information and intuition. World Bank 2016. Country estimates by the Bank are drawn directly from household surveys in 2013 or based on extrapolation or interpolation from surveys in the nearest available years. Countries are judged as having recorded meager progress if their poverty rate fell by less than one percent—not percentage point—a year over the given period. This analysis was carried out in early 2016 and so excludes surveys that have become publicly available more recently. See, respectively, Beegle et al 2012; Gaddis 2016; Deaton and Aten 2015.